For players who like to experience that loving feeling, Love Your Bingo is the number one amorous destination. The website is home to plenty of sweet, loving features such as heart graphics and blue skies. Overall it's a pretty site with some adorable animations and images. The site is owned by 8Ball Games Limited and is powered by Virtue Fusion software; this means that the game play is simple and intuitive, so that even a new player will have a trouble free experience. When it comes to moving around the site, the navigation bar is located at the top of the page. This is similar to many other websites and makes it easy for the user to get around, sign up, deposit and play their favourite games. Registering an account is fairly simple. To get going, simply hit either the 'Join Now' banner on the homepage or 'Getting Started' tab on the navigation bar. Once this has been completed, a pop out registration screen will be presented, prompting the new registrant to insert personal details and card information. It doesn't take long to get the action started '“ just enter the required information, choose a password and username, and then you're good to go. Adding funds to an account is effortless and the following payment methods are accepted: Visa, Visa Electron, MasterCard, Maestro, paysafecard, Click2Pay and Ukash. After a swift registration, the playing lobby will launch before you, giving you the chance to choose from a variety of options. The website is home to 90 Ball, 75 Ball and Pattern games, as well as Speed Bingo. Additionally, the site offers a home to Deal or No Deal variant and Joker Jackpot. If it's the free things in life that float your boat, be sure to play the Free Bingo games that are on offer too. 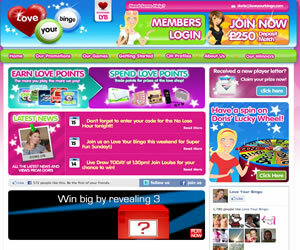 Promotions are hot to trot at Love Your Bingo as players are treated to a fabulous Loyalty Scheme. The scheme allows roomies to reap an abundance of rewards by collecting Love Points. The more points accumulated through playing cash jackpots, chat games and liking the Facebook fan page, the more points you have to turn into cash and gifts. 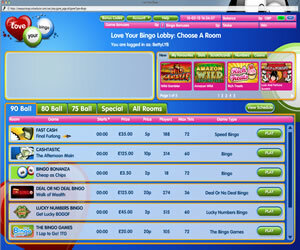 The Bingo Bonanza room at LYB is one of the most popular rooms at the website. It is where most of the exciting competitions and promotions are hosted and tickets are certainly cheap and extremely cheerful; this is the perfect starting point for new LYB roomies. Plus, the overall gaming experience is definitely heightened with the awesome 'No Lose Hour'. This is where players are treated to Risk Free games every Friday night between 7-8pm. Friendship isn't overlooked at this brilliant place so it's definitely worthwhile getting your loved ones to sign up and deposit, if you want to earn yourself a free tenner and 1,000 Love Points. If you go crazy for a spin on the slots, the choice of instant win, slots and scratchcards that feature on Love Your Bingo will be right up your alley. 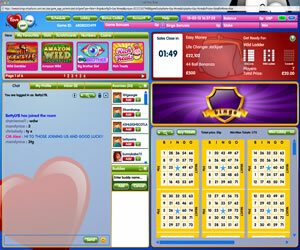 The bingo site has a pretty good instant wins portfolio and the ones featured are popular amongst slots players. Clover Rollover, Cleopatra's Chest, Hollywood Boulevard as well as branded games such as Celebrity Big Brother and Deal or No Deal can also be found at this gaming site. 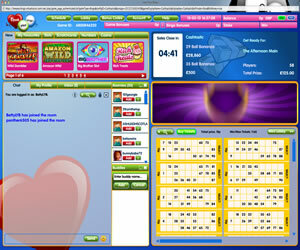 Love Your Bingo currently offers 75, 80 and 90 ball bingo games with a few different variants of the 75 ball game. You'll find traditional pattern games, multi-part and multi-line 75 ball games here. There are also all of the traditional instant win games on offer that you usually find at Virtue Fusion/Playtech sites. Wagering requirements at Love Your Bingo are 2x the amount of bonus but you are asked if you wish to accept the bonus and the wagering requirements which means you have the option to decline.